The Hieromartyr Cyprian, Bishop of Carthage, was born in about the year 200 in the city of Carthage (Northern Africa), where all his life and work took place. Thascius Cyprianus was the son of a rich pagan senator, and received a fine secular education becoming a splendid orator, and a teacher of rhetoric and philosophy in the school of Carthage. He often appeared in the courts to defend his fellow citizens. Cyprian afterwards recalled that for a long time “he remained in a deep dark mist.., far from the light of Truth.” His fortune, received from his parents and from his work, was spent on sumptuous banquets, but they were not able to quench in him the thirst for truth. He became acquainted with the writings of the Apologist Tertullian, and became convinced of the truth of Christianity. The holy bishop later wrote that he thought it was impossible for him to attain to the regeneration promised by the Savior, because of his habits. He was helped by his friend and guide, the presbyter Cecilius, who assured him of the power of God’s grace. At 46 years of age the studious pagan was received into the Christian community as a catechumen. Before accepting Baptism, he distributed his property to the poor and moved into the house of the presbyter Cecilius. Two years after his Baptism, the saint was ordained to the priesthood. When Bishop Donatus of Carthage died, Saint Cyprian was unanimously chosen as bishop. He gave his consent, having complied with his guide’s request, and was consecrated Bishop of Carthage in the year 248. The saint first of all concerned himself about the welfare of the Church and the eradication of vices among the clergy and flock. The saintly life of the archpastor evoked in everyone a desire to imitate his piety, humility and wisdom. The fruitful activity of Saint Cyprian became known beyond the bounds of his diocese. Bishops from other sees often turned to him for advice on how to deal with various matters. A persecution by the emperor Decius (249-251), revealed to the saint in a vision, forced him to go into hiding. His life was necessary to his flock for the strengthening of faith and courage among the persecuted. Before his departure from his diocese, the saint distributed the church funds among all the clergy for the aid of the needy, and in addition he sent further funds. He kept in constant touch with the Carthaginian Christians through his epistles, and he wrote letters to presbyters, confessors and martyrs. Some Christians, broken by torture, offered sacrifice to the pagan gods. These lapsed Christians appealed to the confessors, asking to give them what is called a letter of reconciliation, i.e. an certificate for accepting them back into the Church. Saint Cyprian wrote a general letter to all the Carthaginian Christians, stating that those who lapsed during a time of persecution might be admitted into the Church, but this must be preceded by an investigation of the circumstances under which the falling away came about. It was necessary to determine the sincerity of contrition of the lapsed. To admit them was possible only after penance, and with the permission of the bishop. Some of the lapsed insistently demanded their immediate re-admittance into the Church and caused unrest in the whole community. Saint Cyprian wrote the bishops of other dioceses asking their opinion, and from all he received full approval of his directives. During his absence the saint authorized four priests to examine the lives of persons preparing for ordination to the priesthood and the deaconate. This met with resistance from the layman Felicissimus and the presbyter Novatus, roused to indignation against their bishop. Saint Cyprian excommunicated Felicissimus and six of his followers. In his letter to the flock, the saint touchingly admonished all not to separate themselves from the unity of the Church, to be subject to the lawful commands of the bishop and to await his return. This letter kept the majority of Carthaginian Christians faithful to the Church. In a short while, Saint Cyprian returned to his flock. The insubordination of Felicissimus was put to an end at a local Council in the year 251. This Council decreed that it was possible to receive the lapsed back into the Church after a penance, and it affirmed the excommunication of Felicissimus. When the discord in the Carthage church began to quiet down, a new calamity began: a pestilential plague flared up. Hundreds of people fled from the city, leaving the sick without help, and the dead without burial. Saint Cyprian, providing an example by his firmness and his courage, tended the sick and buried the dead himself, not only Christians but also pagans. The plague was accompanied by drought and famine. A horde of barbarian Numidians, taking advantage of the misfortune, fell upon the inhabitants, taking many into captivity. Saint Cyprian moved many rich Carthaginians to offer up means for feeding the starving and ransoming captives. When a new persecution against Christians spread under the emperor Valerian (253-259), the Carthaginian proconsul Paternus ordered the saint to offer sacrifice to idols. He steadfastly refused to do this. He also refused to give the names and addresses of the presbyters of the church of Carthage. They sent the saint to the city of Curubis, and Deacon Pontus voluntarily followed his bishop into exile. On the day the saint arrived at the place of exile he had a vision, predicting for him a quick martyr’s end. While in exile, Saint Cyprian wrote many letters and books. Desiring to suffer at Carthage, he returned there. Taken before the court, he was set at liberty until the following year. Nearly all the Christians of Carthage came to take leave of their bishop and receive his blessing. Coming to the place of execution, the saint again gave his blessing to all and arranged to give twenty-five gold coins to the executioner. He then tied a handkerchief over his eyes, and gave his hands to be bound to the presbyter and archdeacon standing near him and lowered his head. Christians put their cloths and napkins in front of him so as to collect the martyr’s blood. Saint Cyprian was executed in the year 258. The body of the saint was taken by night and given burial in a private crypt of the procurator Macrobius Candidianus. Some say that his holy relics were transferred to France in the time of King Charles the Great (i.e. Charlemagne, 771-814). Saint Cyprian of Carthage left the Church a precious legacy: his writings and 80 letters. 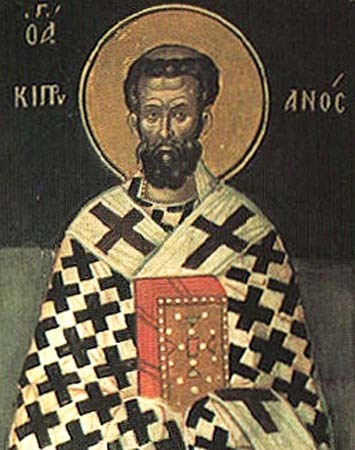 The works of Saint Cyprian were accepted by the Church as a model of Orthodox confession and read at two Ecumenical Councils (Ephesus and Chalcedon). In the writings of Saint Cyprian the Orthodox teaching about the Church is stated: It has its foundation upon the Lord Jesus Christ, and was proclaimed and built up by the Apostles. The inner unity is expressed in an unity of faith and love, and the outer unity is actualized by the hierarchy and sacraments of the Church. Guide of Orthodoxy, teacher of piety and holiness, / luminary of Carthage, God-inspired adornment of confessors, / O wise Cyprian, by thy teachings thou hast enlightened all, O harp of the Spirit. / Intercede with Christ God that our souls be saved.